7.62x51MM NATO Ammunition 2016 Production! This .308 / 7.62X51 NATO ammunition is new manufactured with true NATO spec. boxer primed brass cases and true NATO spec. copper plated bulles, produced in Poland to NATO specs. 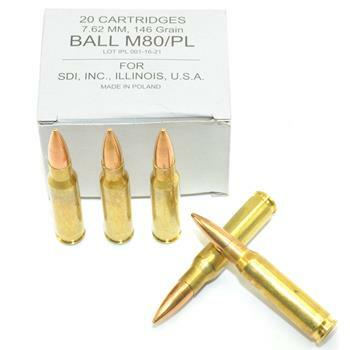 This ammunition is some of the finest ammunition found anywhere and is supplied to many militaries and police forces that demand quality .308 / 7.62X51 ammunition. This 146 grain Full Metal Jacket projectile is non-magnetic and loaded into a high quality reloadable 70/30 brass cases with a boxer primer. Stock up now on this high quality NATO .308 / 7.62X51 ammunition! This product does not apply for any shipping promotions. This item is not able to be shipped to California or New York unless purchased by a FFL Dealer. This item is not able to be shipped to Massachusetts, Washington DC or the City Of Chicago.